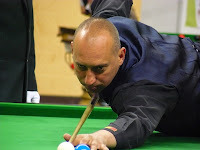 My tournament ended on Tuesday afternoon after a tough match against fellow 'leftie' Frank Sarsfield from Ireland, the first time I have played him. The match, and my tournament ended with a 4-2 defeat in the last 16. Ces't la vie. Another first for me was having this match refereed by Tatiana Kuziomkina, a very experienced and polished referee from Belarus. 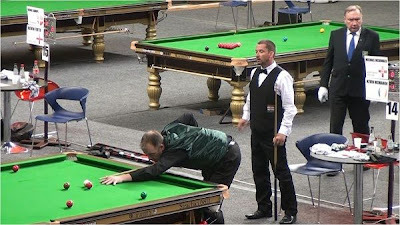 One of the special things about this tournament is knowing that whoever you play, the games will be played in a fair and friendly manner, and the officiating has been top notch. Well done Tatiana. Following the game with Frank I decided to seek some advice from tournament organizer Sergey about my left hand, which hasn't been right all week following an incident in my hotel room. He kindly arranged for Helen from the Olympic Sport Centre (our venue) to take me to the hospital in Daugavpils where an x-ray confirmed a fracture and a dislocation to some fingers. Nice. The strange thing is there has been very little pain all week, and apart from some swelling, and I was able to continue my tournament. So it was a shock when Helen interpreted the doctors advice that I need an operation straight away and then would be in a plaster cast for 5 weeks. The hospital also provided me with the x-ray as a souvenir. Back to the tournament and the Masters division threw up a few surprises last night. 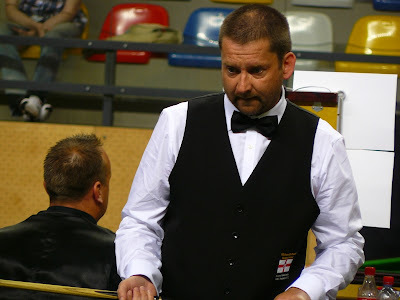 First was the elimination of Enland's Phil Mumford, who lost to talented Belgian Yvan Van Velthoven 4-3 who then proceeded to knock out 2008 winner Alan Trigg by 5 frames to 3. Very well done Yvan, it demonstrates that European Snooker is in good hands.